woman, it was learnt, gave birth to the two children, who were between the ages of six and four, through Caesarean Section (CS). 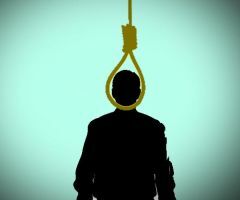 When our correspondent visited her house at Gambari area of the Island, her husband refused to speak. However, some neighbors said the woman bought a bottle of insecticide called Sniper'. Nobody knew what she wanted to do with the Sniper. But a few minutes later we saw the bottle beside her where she was sleeping. By the time people got there she was already dead, a neighbor, who craved anonymity, said. Sympathizers, however, thronged their house to condole with the husband and family members. Hundreds of teachers and students from different private schools yesterday marched on the site of the collapsed building. One of their grievances was that schools should have been given holiday to mourn dead pupils and teachers. 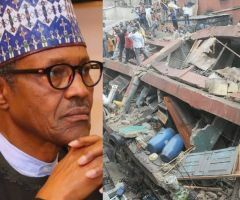 They also called on the government to pull down every distressed building on the Lagos Island to check further loss of lives. 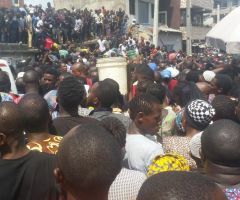 Meanwhile, a mother, Yetunde, whose son was injured in the three-storey building which collapsed was too traumatized by the sight of the boy lying critically in the hospital bed. She had not sat down for over nine hours. She had been moving from one corner of the Lagos Island General Hospital to the other in search of the prescribed drugs and other needs demanded by the doctors. Yetunde is one of the lucky parents, whose children were pulled out of the rubble alive. The boy survived the injuries and traumatic experience. His two legs were in Plaster of Paris (POP).Recollecting the event of the past 24 hours, Yetunde said that she was the person that dressed the boy for school. She had already left the house, when she received a call that the school, which her son attends, had caved in, leaving many children trapped. She called on well-meaning Nigerians to pray for the speedy recovery of her son. The woman who refused to give the name of her son, busted into tears whenever she made attempt to speak. Among the visibly disturbed women at the Island General Hospital was a lady who gave her name as Taiwo Jimoh. 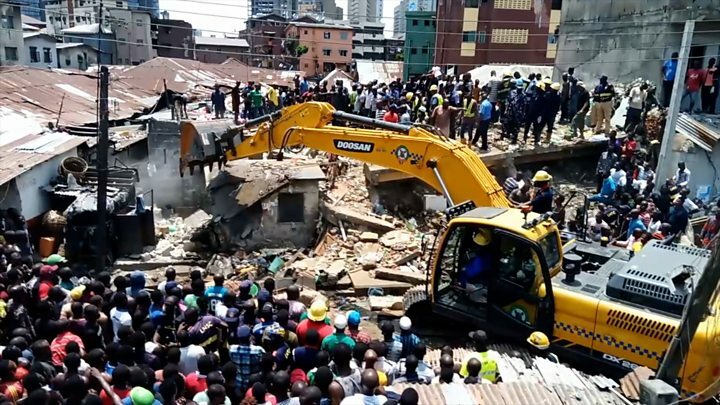 Jimoh, who was among those resuscitated by the staff of the General Hospital following the shock from the tragic incident, said she was in the hospital to commensurate with her sister, whose three children were involved in the collapsed building. She said: Samiat, Rodiyat and Roqib are my sister's children. One of the children, who were a year and six months old, died at the Massey Children's Hospital. My sister's children are Samiat Afolabi (six), Rodiyat Afolabi (10) and Roqib Afolabi (18-month-old). We lost Roqib in the incident. Roqib was the only son and youngest among the children. Roqib was aged 18 months. He was in the creche of the school.